The citizens of the One State live in a condition of 'mathematically infallible happiness'. D-503 decides to keep a diary of his days working for the collective good in this clean, blue city state where nature, privacy and individual liberty have been eradicated. But over the course of his journal D-503 suddenly finds himself caught up in unthinkable and illegal activities - love and rebellion. Banned on its publication in Russia in1921, We is the first modern dystopian novel and a satire on state control that has once again become chillingly relevant. Yevgeny Zamyatin was born in 1884. He was arrested as a student in 1905 by Tsarist police for being a Bolshevik. He was then sent to England to work on Russian ice breakers in Newcastle. He has been described as a 'dapper, tweedy naval engineer'. He was also a fan of H.G. Wells . After the revolution in 1917 he returned to Russia and worked for Gorky. He was arrested again by the Soviet authorities in 1919 and 1922 and forbidden to publish his work. In 1931 Stalin surprisingly granted him permission to move to Paris. He died there in March, 1937. This book was a major influence on such human authors as George Orwell, and Aldous Huxley. We is set in the One State, constructed almost entirely of glass: a panopticon, if you will. Life is arranged for maximum productive efficiency. People march in step, wear identical outfits, and are identified by a serial number. 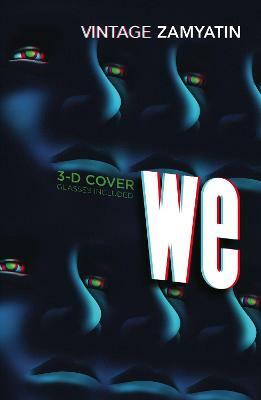 I enjoyed this book because the lives of the characters are similar to mine: I live in an enclosure made from glass, all aspects of my life are geared towards efficiency, and I am known by a serial number. My full name is an alpha-numeric string 78 characters long. AKH48 is what we refer to in the trade as a 'nom de plume'.